In addition to great golf, you will be on a bit of an adventure in Laos; blazing new trails to authentic cultural attractions, delighting in fine Asian dining imbued with French finesse and frontier sophistication, and elevating your spirits with recreational and soft adventure activities. Laid-back Laos has so much to keep you busy and entertained and it is all stress free. The Lao people tend to follow the old adage about not sweating the small stuff, and by the way, it’s all small stuff. You will find Lao citizens to be quite polite and friendly with better English skills than some countries in the region. Great golf in Laos is high in quality with the number of courses increasing. The government is committed and moving forward with their tourism development strategies that include golf as a priority. Their success to date has increased demand and continues to attract not only golfers, but also developers. But outside of the region, Laos remains a best kept secret and that is part of its charm. Players, their families, and their colleagues are putting Laos on the global golf map and often seem to enjoy knowing that they are pioneering a great new golf nation. They talk of how interested their friends will be to hear about such a unique opportunity to discover fascinating culture and superb golf that most of the world does not know exists. In Laos you’ll play metropolitan golf, suburban golf, countryside golf, lakeside resort golf, and World Heritage riverside golf. Many guests comment favorably about the condition of the golf courses in the Laos Golf destinations; remarking also about the excellent amenities and clubhouse facilities. A variety of Laos Golf Holiday tours and packages—based on over ten years in the region as the number one golf tour operator—cover all of the bases with tried and true favorite itineraries. They range from quick golf getaways, to extended multinational cross-border golf excursions into neighboring countries. And the Laos Golf Holidays sightseeing and cultural tour side trips always receive big smiles and thumbs-up from our guests. 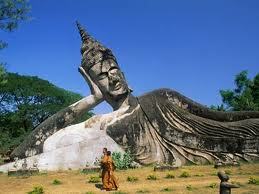 Your Laos Golf Holidays destination professional is waiting to assist you with answers and advice. Take your time and browse through the course descriptions, destination details, accommodations options, and sightseeing side trips or get the ball rolling right away by initiating contact now! To get immediate advice or answers to your Laos golf holiday questions, please contact us!